DryFruit Meetha Paratha | Stuffed Paratha Recipe : Paratha or paranthas or parauntha are most popular breakfast meal, especially in North India. It is a combination of words “parat” and “atta”. It is a flat-bread that originated in the north of India sub-continent and is a traditional staple of the area. They are usually served with pickles, raita, dal makhni and ginger tea. No matter if it is plain paratha or lachedaar parantha or stuffed one, they are just fabulous. They have not only conquered our hearts but our lunch boxes too. But today we are going to make Dry fruit meetha paratha. Yes, you read that right meetha paratha i.e. Sweet Paratha with lots of dry fruits and sugar. This Sugar paratha recipe is very simple and easy to make. In fact, you can make it any time and even when you don’t want to make sabji or side dish. Because that is the everyday problem or a question of every home maker “What to make?”, “what to do?”, “will they love it or not”. Arghh! No more worries now. So, Let’s start with the meetha paratha recipe. Take a pan, turn on the flame and add 1/2 bowl of sesame seeds to it. Roast it till it becomes fragrant and turns golden in color. It will take 4-5 minutes hardly. Now take a bow and add chopped dry fruits, roasted sesame seeds and crushed sugar to it. 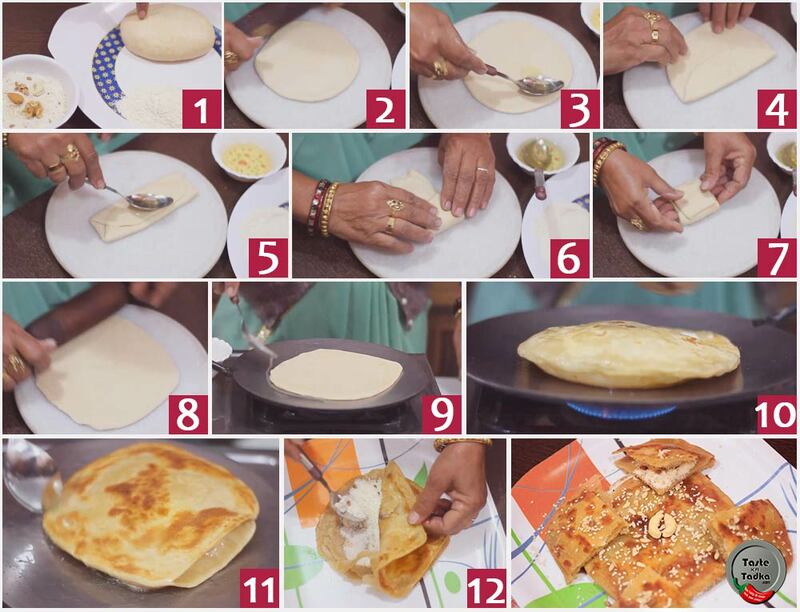 Now fold the paratha three times(As shown in video and image also). Again spread ghee and again fold it three times. Again dust with some flour and roll into square paratha. Now open the layers of paratha and start filling the dry fruit mixture into it and spread evenly. Drizzle the melted ghee on the mixture and on the top of paratha also. Garnish with melon seeds and roasted sesame seeds. Our delicious sweet layered Paratha – DryFruit Meetha Paratha is ready.